I designed The Brothers of Thunder PDF for Icons as a part of a fund-raiser bundle for the Southern Poverty Law Center. Founded by civil rights lawyers in 1971, the SPLC is dedicated to fighting hate and bigotry and to seeking justice for the most vulnerable members of our society. Using litigation, education, and other forms of advocacy, the SPLC works toward the day when the ideals of equal justice and equal opportunity will be a reality. 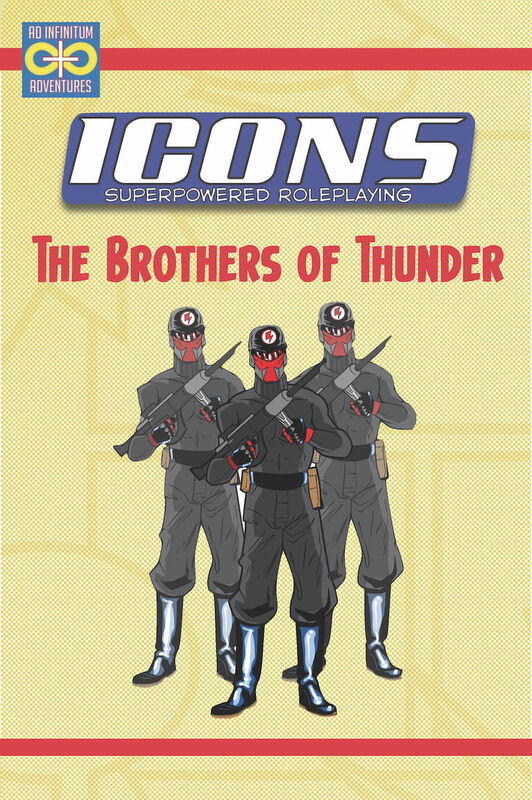 Artist Dan Houser and I created an all-new Icons product, a 7-page PDF on the neo-Nazi group called “The Brothers of Thunder” including background, adventure ideas, stats for their rank-and-file members and the Brothers two super-powered agents, the twins Donner and Blitz! Pit your heroes against the forces of hate and support a great cause in the process! Now that the fundraiser for the bundle has ended, I’m making the stand-alone Brothers of Thunder PDF available as a pay-what-you-want product, and all profits from it will continue to be donated to the SPLC. Thanks to all of the heroes who offer and will offer their support, and to those who do the heroic work for fighting for real-world justice every day! This entry was posted in Publishing and tagged charity, icons, SPLC. Bookmark the permalink. ← Fight Nazis and Support the Southern Poverty Law Center!